There are very slight variations between them. These variations are somewhat noticeable in the Queen's hair. The hair on the (small bust) piece shows more detail than the hair on the (large bust) piece. Being a 1 year type coin one would not expect any major varieties to exist but one does. These varieties exist due to two different obverse dies that were used. 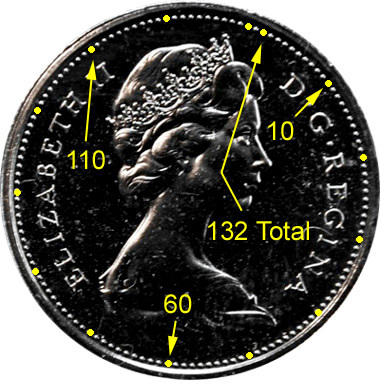 A new design with a smaller bust of Queen Elizabeth II was to be used but some coins were minted with an older obverse die giving way to a large bust variety. One way to tell them apart is by the circle of beads surrounding the design. Some reference books may refer to them as Large Bust (132 beads) and Small Bust (120 beads). But, to count the number of beads will make you cross-eyed after awhile so we highly recommend that you not do this! Instead, the easier way to identify the difference is by simply looking at how close the beading is to the edge or rim of the coin. Large bust beading is extremely close to the rim while small bust design has beading that is further away from the rim.